Players must reach the marine landing zone and defeat enemy forces. Operation Cherry Blossom is a PVE Scenario which has the friendly task force tasked with reaching and defending a marine regiment that is embarking on a shore assault. The friendly force will then need to find and destroy enemy aerodromes. Players may take Tier VIII U.S., U.S.S.R., U.K., and French ships into the operation. The allied force consists of 7 player ships. Secondary “Defend both military transports.” Both transport ships survive the engagement. Secondary “Ensure that at least 4 allied ships survive.” 4 allied ships survive the operation. Secondary "Defend both allied regiment positions.” Both allied positions are successfully defended. Secondary “Destroy 50 aircraft” 50 aircraft destroyed. Secondary “Destroy flagship Atago.” Players find and destroy Atago. The battle will unfold near the shores of Bougainville Island in Oceania. If you want to see the first rays of the rising sun again, you'll have to give it everything you've got in this encounter. Square off against Japanese forces, fighting under the cloak of night to repel their attack and provide cover for allied landings. At night, the detectability of your and enemy ships is significantly reduced, while dispersion is slightly increased. The Japanese forces rely on illumination shells and bombs that increase the detectability of a ship. Be careful and avoid the bombs’ areas of effect, otherwise, the enemy forces will easily detect your ship and open fire on you. Your mission in the nighttime battle is to repel the Japanese attack, cover the departure of the allied ships from the shore, and defend the landings against seaborne strikes. Morning will arrive soon, and allied aircraft carriers will join your squadron at dawn. 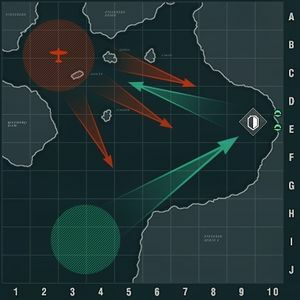 Get ready to repel enemy airstrikes, progress with your offensive against the Japanese forces, and destroy enemy aerodromes. The time of a ship's increased detectability after firing primary armament at nighttime is reduced from 20 to 8 seconds. Avoid flares and illumination shells to remain undetected as much as possible. Ships with decent AA capabilities will prove useful in accomplishing the secondary task of shooting down 50 planes. The operation is based on the real battle at Empress Augusta Bay on November 2, 1943, where the Japanese squadron of Admiral Ōmori and the American task force of Rear Admiral Merrill clashed with each other. This page was last modified on 29 July 2018, at 17:12.